Newton Aycliffe manufacturer Ebac has recruited an experienced sales professional to support the expansion of its washing machine sales into the Midlands. With more than 30 years industry experience, most recently at Hotpoint where he worked for over a decade, Richard Foster has joined the Ebac team as sales development manager. During his career he has established a real drive and vision for the UK white goods market and as a member of the Ebac team, he sees the brand firmly placed at the centre of that vision, as a future industry leader. Foster is responsible for the Midlands region, an area in which he already has excellent relationships with many of the local retailers, attained during his career. His objective is to work with the independent retailers to be able to provide the market with the only British-made washing machines, and the company’s well-established dehumidifiers. Foster is confident that he can work alongside the company to help it achieve continued success. “This is a really exciting opportunity to work with a new name in the white goods industry, and help develop the business into a household name,” he said. “One which will not only be linked to quality dehumidifiers, but also safe, reliable British made washing machines”. Ebac became the first company in more than two decades to bring back the manufacture of British made washing machines last year. The County Durham-based company invested £7m in the development of the venture, with the new models comprising revolutionary dual fill technology, as an alternative to traditional cold fill machines, which will lower energy bills through shorter wash times. Ebac is also offering 10 year parts and labour warranties on selected washing machines. Ebac’s washing machines join an established stable of electrical goods. It is Europe’s leading manufacturer of bottled watercoolers and domestic dehumidifiers and with the recent acquisition of the Norfrost brand, it is also growing sales in the laundry and refrigeration sectors. Tony Hird, business development manager at Ebac, said: “Richard is a great addition to our washing machine team. 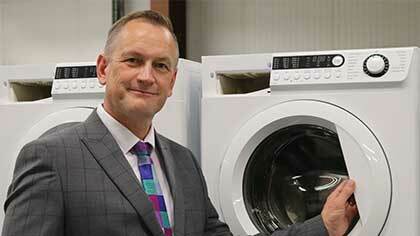 “His experience at Hotpoint will be invaluable as we continue to move into new markets across the UK.